If I’ve learned one thing as a fan of The Sims over the past 14 years, it’s that the first few days I spend with a new installment will be filled with disappointment. It happens every single time, and I’m sure I’m not the only one. This early window is probably the worst possible time to judge a new base game’s quality, because years of playing the previous version bloated with various add-ons invariably builds up my expectations for what I should be able to do in the new game. No matter how rational I try to be, it’s difficult to adjust from playing with seemingly endless content to starting back at square one. It’s a kind of tunnel vision where you get so focused on the things you wish were there that you ignore everything else that is. But, like a tunnel, when you eventually make it out of the other side the entire world will open up in front of you. It was a long tunnel, but I’m through. The Sims 4 has been streamlined tremendously compared to its older siblings, and while experienced players like me might have a rough time initially adapting to the new UI and control scheme, it is ultimately much less cluttered and more efficient than it used to be. I particularly like the way that the icon for the most urgent need will replace the generic icon in the bottom right corner, which lets me see immediately what my sims need most, while clicking on a need in the panel itself will automatically queue the action that resolves it. But not everything is crystal clear, and some important features have been streamlined nearly to the point of invisibility. For example, it’s easy to miss the menu that allows you to define your sim’s behavior at work, which you access by clicking on the “At Work” icon in the portrait panel. If you’re trying to climb the corporate ladder quickly these interactions are absolutely vital, and there’s no reason for them to be as obfuscated as they are. While The Sims 4 remains a Sims game—create your household and build or ruin their lives as you see fit—its developers have tried to inject more personality into the game across the board, even in character creation. 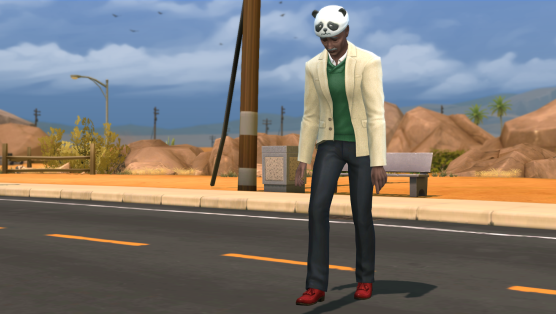 It works well in the case of the different walk animations players can now choose from, but less so when it comes to things like sims’ voices. While voice options were previously numbered, now male sim voices are described as “Clear”, “Warm” or “Brash”, while female voices are “Sweet”, “Melodic” or “Lilting”. This (along with the way the game limits tattoo options based on a sim’s gender) is one of my biggest pet peeves. It’s an entirely unnecessary gendered distinction that does not accurately describe the voice samples they’re assigned to. Additionally, the female options all essentially describe the same thing: A cloying and stereotypically female cadence. Three descriptors that essentially mean the same thing, leaving no room here for the girls who speak clearly, warmly, or brashly. That really gets under my skin, especially since I can give a female sim the same cocky swagger I can give a male sim, without being limited to a sashay, a saunter or a skip. The most prominent changes in The Sims 4 are sims’ moods, and their ability to multitask. Both are mechanics that the games have toyed with in the past, but have never quite gotten right until now. In previous games, there were certain actions that could be performed at the same time; sims could sit and read, watch television and chat, or carry a baby in one arm while they checked the mail. The Sims 4 expands on this with multitasking, where several actions can be strung together. Sometimes this works phenomenally well, like when a sim decides to bring a book into the bathroom or when a couple have a conversation with each other while they work at their respective desks. But sometimes the seams show. 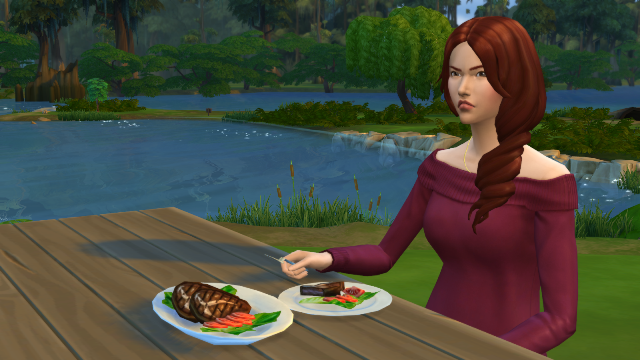 Your sim might run outside to greet a friend, a fresh caprese salad in tow, and eventually leave the plate on the curb to rot for a few days because there was nowhere for them to set it down once they’d finished eating. These kinds of hiccups are a fact of life with any Sims game, and even though they highlight the flaws in its systems they are at least entertaining. Moods were also present in previous Sims games, but in a far less natural way. The Sims 3’s “Moodlets” were effects based on what was happening to your sim that essentially just added to or subtracted from a sim’s overall well-being, which means that an awkward social encounter could have the same general effect as being hungry and bored. In The Sims 4 these moodlets have been rolled into a larger system. Now your sim’s intense embarrassment could easily override their flirtiness for example, and affect their actions and behavior accordingly; if you just got rejected on a date, it follows that you might be more interested in curling up in bed than small talk… Though you could certainly try the latter and see how it goes. Maybe they’ll recover, or maybe things will only get worse. Moods impact your sims’ interactions, interests and even their work performance, and this system manages to feel so much more human than moodlets did previously. When you see your sim return from work hunched over and lip-trembling, it’s a lot easier to feel downright bad for them than it was when they were just abstractly unhappy. The more I engaged with my sims’ moods, the more invested I became in them. The Sims 4 generally did a very good job at getting me invested. I typically play The Sims in a very detached way where I’m more interested in messing around with the tools than the sims themselves—but that’s not how I found myself playing this time. In addition to mood management, The Sims 4 adds clearer goals and more frequent rewards for advancing sims’ careers and aspirations, but even dates and parties now come with simple tasks that incentivize you to play along. In previous games players were encouraged to make sure that events like these were “successful” (again, quite abstract) but weren’t given much guidance or reason to do so, so this change is another welcome one as far as I’m concerned. As much as it does to increase my engagement with individual sims, The Sims 4 seriously drops the ball in terms of making me feel like part of a living, breathing world. That was of course the sales pitch for The Sims 3: No more loading screens, no more invisible fences. The world (well, the town) was your oyster, and while your sim was making coffee at home a sim a few blocks away was learning to play the piano or going for a morning jog. Your household was not the center of the universe and in videogames (where player characters are so often Chosen Ones) being a small part of that larger whole was nice. It was realistic. In The Sims 4, the two towns are broken up into five different chunks each, and moving between them requires a loading screen. If that loading screen gave me free reign of that neighborhood I might feel better about it, but if you decide to send your sim to the library and then want them to visit the gym next door, it requires another load. You can run a full lap around the perimeter of the building, but you can’t go inside without yet another loading screen. Not that there are that many venues worth visiting anymore. The beaches, the stores, the spas, the theatres and the restaurants are gone, leaving your sims without much variety in terms of where they can go and what they can do even compared to The Sims 3’s base game. What’s more, when you do load into a public venue you’re likely to see a stream of random sims come rushing up to join. Remember, these places essentially cease to exist when your sims aren’t present, so what you’re seeing is the game awkwardly rushing to populate them for you like it’s The Truman Show. It feels like a big step backwards. But it has to be said that The Sims 4 runs phenomenally well on my aging computer, even on ultra settings, and part of that is undoubtedly due to the pocketed world loading. That (in addition to the removal of The Sims 3’s Create-a-Style feature) gives the game far less to keep track of environmentally at any given time. I do mourn the loss of Create-a-Style, which allowed players to re-texture clothing and objects using dozens of tintable patterns, because the preset colors of items in The Sims 4 vary wildly. Try to match a white top to a white skirt or a wooden table to a wooden chair and you’ll see exactly what I mean. There’s no consistent palette, not even for the most basic color staples, and it can be intensely frustrating. But as neat as it was, Create-a-Style was known to be a tremendous resource hog, and if that’s the cost I have to pay to avoid 20 minute loading screens and constant crashes… Well, I can probably get used to simulated life without it. Although The Sims 4 and I didn’t start out on the best foot, overall I’ve been enjoying my time with it. Prior to The Sims 4’s launch, fans knew a lot more about the minutia of what wouldn’t be included than what would be, or how the gaps left by those omissions could potentially be smoothed over through new systems. Returning to the idea of tunnel vision, it was very easy to hone in on these itemized lists (which include things ranging from dishwashers to toddlers) because of some pre-existing sensitivities within The Sims fan community. The Sims is one of the most aggressively monetized game franchises, and with every installment it only gets worse. The Sims 4 is no exception, and it will have the expansions, the “stuff packs” and the cash store introduced through its predecessors in addition to a subscription for premium store access. With all of that in mind I will say that The Sims 4 sometimes feels light to me. I still get restless or frustrated when I can’t do things I took for granted in previous versions, and the idea that EA is just biding their time before launching the first pieces of add-on content doesn’t make me feel better about that. Even so, I am still looking forward to seeing what The Sims 4 will become, both through official expansions and the fan modding community (which is already gaining momentum). The foundation is absolutely there for a Sims game that’s sleeker and more compelling than any of the ones that came before. It’s not quite there yet, but it might be soon. And then The Sims 5 will come out, and the cycle will begin anew.